Later that day, Yahoo News White House Correspondent Hunter Walter asked Trump during a cabinet meeting if he would ban the press from the White House, to which he did not respond. During a press briefing that afternoon, White House Press Secretary Sarah Huckabee Sanders was asked, in reference to Trump’s tweet, if that was a line that the Press Secretary would be willing to cross. Sanders responded: “We’re very committed to a free press. And I think that we demonstrate that every single day, not only by me being up here and taking your questions as I’m doing right now.” She then later stated that it was “an outrageous claim” to suggest this administration does not promote freedom of the press. The White House Correspondents' Association reacted to the president’s tweet, stating: “A free press must be able to report on the good, the bad, the momentous and the mundane, without fear or favor. And a president preventing a free and independent press from covering the workings of our republic would be an unconscionable assault on the First Amendment." After NBC News released an article that claimed Trump called for an increase in the US nuclear arsenal, the president suggested in an October tweet that media licenses should be challenged if they report false information. 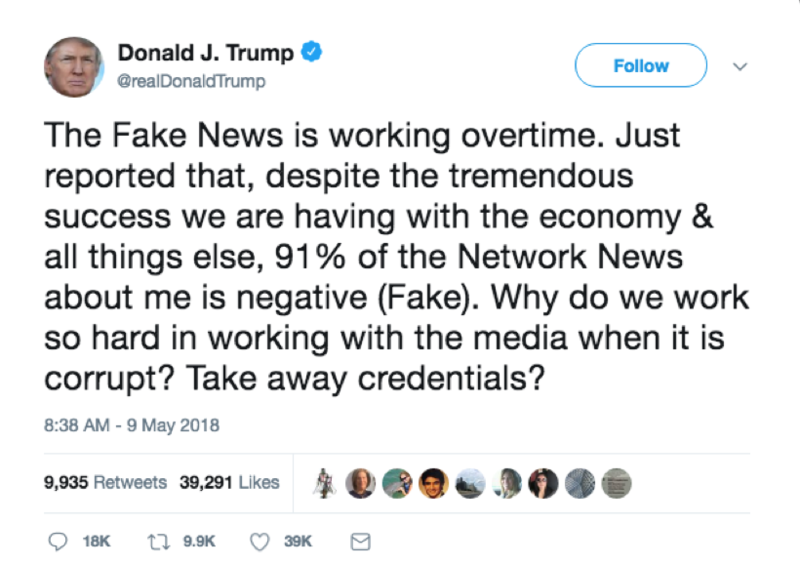 Similarly, multiple news outlets were banned in February 2017 from an off-camera White House press gaggle, to which only a handpicked group of reporters—mostly from outlets that have covered Trump favorably—were invited. Former Fox News host Bill O’Reilly said during a speech at a party on May 6 that he would like to choke CNN White House correspondent Jim Acosta, who was not in the audience. First reported on May 7, O’Reilly told a crowd that included White House Press Secretary Sarah Sanders, "I would love just to get my big hands around Jim Acosta's neck." The party was in celebration of the new United States Ambassador to Germany, Richard Grinnell. The next day, O’Reilly revealed during his online show, called “No Spin News” a conversation he had with Sanders at the private celebration, in which he volunteered to accompany her at press briefings. "And if somebody gets out of line I will tell them exactly what I think of their behavior,” he had said. During her time as press secretary, Sanders and Acosta have had a tumultuous relationship. According to the US Press Freedom Tracker, of which Reporters Without Borders (RSF) is a part, eight journalists have so far been physically attacked in the US in 2018. The most recent attack reported by the Press Freedom Tracker occurred last month when ABC7 Eyewitness News reporter Tim Fleischer was punched in the face while covering a story in Queens, New York. Newly-appointed State Secretary Mike Pompeo didn’t take questions from reporters during his first press conference on May 7. The presser was held to allow Pompeo to discuss modernizing the North American Free Trade Agreement (NAFTA), security concerns, and drug trafficking. During Pompeo’s confirmation hearing last month, New Jersey Senator Cory Booker asked him his stance on press freedom. Booker said, “You’re going to engage with the press. Be open, be transparent, allow a robust engagement,” to which Pompeo responded: “It is my every intention, yes.” Prior to his dismissal, former State Secretary Rex Tillerson often limited press access; he held press conferences that only included foreign media outlets and invited only one reporter on his first trip to Asia in March 2017. On May 9, the Federal Communications Commission (FCC) announced Obama-era net neutrality rules will expire on June 11. The new rules could allow Internet providers to block, slow down, or discriminate against online content. In December, the FCC voted 3-2 to repeal protections that had been adopted under President Obama. Eliminating net neutrality could negatively impact the free flow of information and the plurality of voices online. Some 22 states have sued the FCC to try and stop these new rules from taking effect, and the Senate is expected to vote to prevent the repeal of net neutrality this week.